Charlotte Tilbury’s cosmetic line is one that has been constantly raved about for the last while. I only heard about it this year and after watching her video re-creating the wedding look she did for Amal Clooney, I was absolutely convinced that I needed to try her products. One of the products I was most interested in was the Light Wonder Foundation. It looked so amazing on the model she used in the video and since it seemed to be a dewy foundation, I decided I wanted to give it a try. This innovative technology breathes a diaphanous veil of youth-enhancing tint across your complexion, evening out imperfections and moisturizing the skin. It’s like a halo effect of luminosity and colour. A pool of youth-boosting actives helps reduce wrinkles, fight uneven skin tone and smooth over the surface for a “baby-skin effect”. A botanical alternative to retinol stimulates epidermal renewal by kick-starting collagen production, delaying the onset of wrinkles and creating a perfect makeup base. Pseudo-ceramides hydrate your skin for up to 18 hours. For dry, normal, combination skin types. So basically this foundation is supposed to give your face an angelic glow. Honestly, if I didn’t see that video which inspired me to look into this foundation, I don’t think I would’ve been sold on it based on those ridonkulous claims, however I was a believer and needed to test it out for myself. For the purposes of this review, I decided to apply a primer to one half of my skin and leave the other half bare (i.e. just with moisturizer) so the full effects of this foundation can be seen. The primer I used was the Smashbox Pore Minimizing Photofinish Foundation Primer which is on the left side. Before. Left side: with primer. Right side: bare skin. Once I applied the foundation, I noticed that it was fairly dewy. It blended out well while using a buffing brush (I used the #45 Sephora brush) and the coverage was light to medium. Another thing I noticed was that the foundation immediately started settling into my pores and fine lines on the half of my face where I didn’t use a primer. My skin is currently more of a combination type but remains oily in the T-zone, so that could be why. I also noticed that despite this foundation being more dewy, it appeared to be quite cakey around my nose and it clung to some dry patches that I had. This wasn’t a problem if I moisturized really well, but it was quite surprising. I also had to apply some of the MAC Prep + Prime Highlighter in Peach Lustre around my mouth underneath the foundation because I found that it made that specific area look quite dry and grey if I added more product to cover up the darkness without it. Because of this, I don’t think this foundation is very buildable. After. 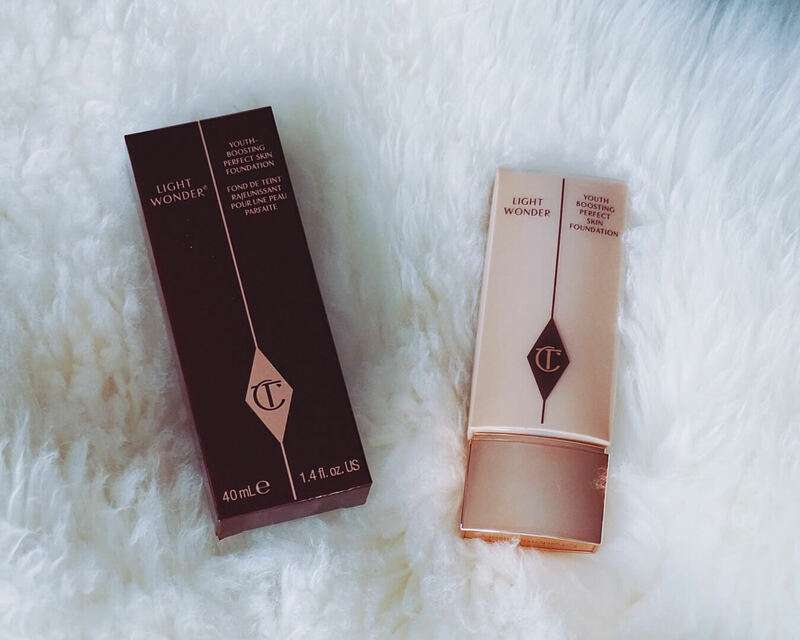 Charlotte Tilbury Light Wonder Foundation in Medium 8. Left side: with primer. Right side: no primer. All this foundation did was even out my skin ever so slightly while giving it a bit of luminosity, but not as much as I expected it to. It definitely did not give me a “baby skin effect” given that it just settled into my pores, however the left side where I applied primer looks pretty good and actually does look smoother. Immediately after applying this foundation, my T-zone already started to get shiny, so I decided that I had to powder those areas unless I wanted to look like a greaseball at work. The rest of my makeup applied fairly patchy over the foundation, so it may be a good idea to lightly apply some powder all over just to avoid that. I will say right now that if you’re looking for a foundation that’s relatively lightweight and low maintenance but also long-lasting, do not buy this. I had to blot at least 5 or 6 times throughout my work day, and whenever I would check the mirror to see how my face was doing, I was shocked by how greasy I looked. It is incredible dewy (read: greasy) and should only be used on individuals with very dry skin. I felt by the end of the day that my foundation was probably gone. After several hours, my makeup looked like this. It looks like it wore off for the most part, especially on the side of my face where I didn’t apply primer. On the other hand, the side with primer looks pretty damn good; those pores are practically non-existent. So if any of you are in the market for a pore minimizing primer, look no further! Anyway, back to this foundation. You can see that it settled into my laugh lines as well, making them look much more apparent. My face doesn’t look nearly as greasy as it did only because I blotted about 45 minutes prior to this picture being taken. I wanted to love the Light Wonder Foundation so bad, but it ended being a huge disappointment. It was basically a very greasy, cakey, and expensive tinted moisturizer. I recommend staying the hell away from this foundation if you have combo-oily skin. If you have dry skin, this could be a winner for you. Having said all this, I still am very willing to try other products from the Charlotte Tilbury line, but only because their customer service is impeccable. So even though my first product from them was a complete bust, I’m hoping I’ll have some better luck next time. Aw! I’m sorry you didn’t have a good experience with this foundation! Due to my extremely dry skin, this foundation is one of my absouloute favorites! Her magic foundation is great for combination/oily skin! you didnt airbrush the left side of your face did you?! Nope! That’s the side of my face with primer, though. The Smashbox Pore Filling primer is truly amazing! Wonderful review. But it looks like one side of your face is exposed to more light that the other – so they arent really the most fair comparison of both sides. i would say completely face a window or completely face away. LOVEYOU!! Hi Linda! Thank you for checking out my review and thank you so much for the feedback! You’re right, the light source I used while taking photos when I initially started my blog wasn’t the best! I’m hoping that the pictures I include in my reviews as of late have improved, and I’ll make sure to have adequate lighting for future foundation reviews!